This post is long overdue. Better late than never! There couldn't have been a better place to meet with planner gals and have a tea party with a side of FILFOAX!!! This meet up was held on Saturday, July 13, 2013. In case you are wondering what we had to eat, this was our menu. I ran 30 minutes late! I greatly apologize to everyone who patiently waited for me. I did bring my oldest daughter with me. She was excited to show off her Personal Fuchsia Apex Filofax. I also brought with me, my sister-in-law, Sarah, who flew in from Sunnyvale, who I've also enabled to use a Filofax. She brought along with her, the Pocket Teal Baroque. I brought with me as much as I could, 8 in all. Everyone had saved the head of the table for me. We started off going around the table introducing ourselves and sharing where we were from. 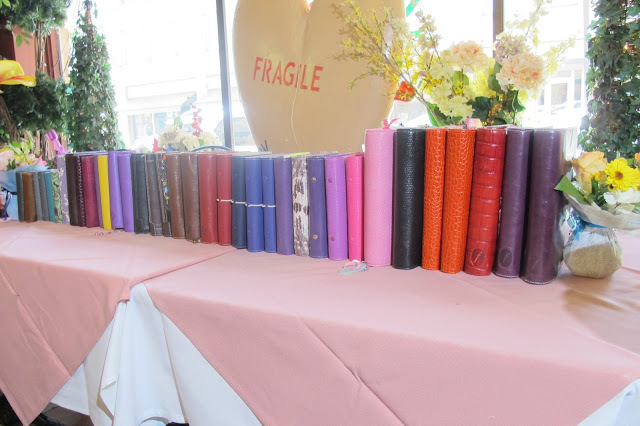 As we had our brunch, I mostly chatted about the Filofax organisers, doing comparisons, sharing each others dividers, and how each person uses theirs. Karen shared her Personal Raspberry Chameleon from 1989-90. It had the raspberry colored rings to match the organiser, and the leather was much different to Jeannie's more recent Black Chameleon. Karen also brought her A5 Red Balmoral which doesn't have the full length pocket as some other Balmorals do. We were also fortunate enough to have so many different colored Maldens in Orche, Purple, Grey, Crimson. Then, we had to do the infamous, "TOWER OF FILOFAX ORGANISERS"! But since we had over 36, we just put them side by side. I did give out some special gifts to everyone who attended, as well as some Philofaxy business cards. Jeannie was also kind enough to give everyone a little something special. Thank you Jeannie! I also, received a gift from Clarisa for hosting the meet up! That was very sweet of her to do. which came out this year, just for our meet up! Some of which included the Sketch, Doodle, Pennybridge, The Original, Calipso, Saffiano, Flex Folio, and some Malden iPad cases. As you can see above, we got a look at what the Aqua Malden color will look like. really wanted to get The Original in Fluoro Pink! More of what they had in stock! Mini, Pocket, Personal, and A5. They even had some of the new collections for sale. A special thanks to Corie and Waylon for having us. They were very kind and friendly to us. FILOFAX also let them have a special giveaway for us, which we all entered in our names into a box for a drawing later that day. I was lucky enough to have won one of three prizes! A Pocket Brown Sketch! Thank you again for having this great giveaway! We had so much fun! Next, we all sort of went our separate ways. Some of us followed me to Daiso and ArtBox, but unfortunately didn't find much. We didn't get a chance to visit some of the other stores I wanted to go to. Nonetheless, it was a great opportunity to meet with the people from the Philofaxy community, newbies, veterans, and even those who have yet to get a Filofax! Everyone was very friendly. I am glad to have met you all and I hope everyone enjoyed the day! They next day, I was in town, and dropped by VROMAN's again! This time, I brought my cousin, Jessica, who has been wanting to get her first Filofax. So, I brought her over to take a look at some for herself. I also took this opportunity to take some more shots of the new collections. I wanted to see if I could fit myself into it. I really needed to try it out for myself. Must get the purple one! A camparison of the Aqua Malden color, with the Teal Calipso and the Pocket Aqua Saffiano. The Aqua Saffiano is very similar in color! Hope to have another Meet Up soon! Possibly more south, around Costa Mesa/ Corona Del Mar around end of August, or early September. I will post more information about future meet ups on my blog or on Philofaxy! Watch our video slideshow here! Looks like y'all had a good time, wish I could have come too!